If you have zero firsthand experience with a sudden outbreak of the undead, never fear! 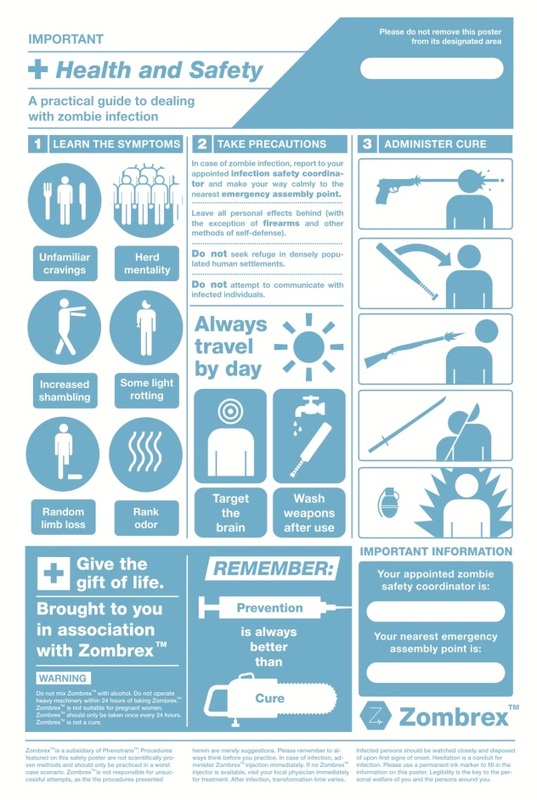 The wonderful people at Phenotrans, the pharmaceutical company behind the anti-zombie medication Zombrex, have been kind enough to provide us with this helpful Health and Safety poster so you’ll know exactly what to do when the time comes. Dead Rising 2 is a copyright and trademark of Capcom Co., Ltd. and Blue Castle Games. Contrary to popular belief, there are worse things than flesh-eating zombies: affectionate, loving zombies. Dammit, woman, what part of "till death do you part" didn't you understand? This tale of marital bliss has been brought to you by The Vault of Horror #28 (December 1952/January 1953) by Johnny Craig, Jack Davis, George Evans, and Graham Ingels.